Knitted support that stabilises through controlled compression. Contoured silicone inserts provide a massaging effect. Removable strap allows for individual adjustment. Provides support and protection for those with minor injuries or arthritis. Can also be used to prevent injury during general sporting or lifestyle activities. 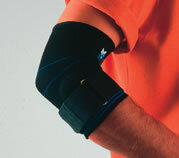 The Vulkan Padded Neoprene Elbow Safety Support offers excellent elbow protection. Contoured design for comfort and fit. Protects the joint against knocks blows and bruising. Measure circumference of the middle of the elbow with arm extended. 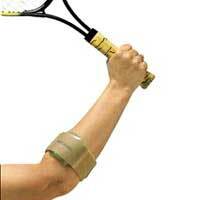 The Tennis Elbow Strap is of lightweight design. Comfortable and unrestricting fit. Indicated for the relief of tennis elbow and similar overuse injuries. Provides rapid pain relief and minimises the risk of re-injury. This comfortable support is ideal for tendonitis and tennis elbow. The sealed air cell focuses more pressure on the involved muscle and less around the arm. 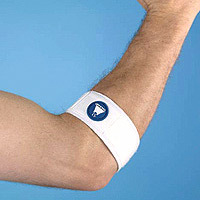 Pressure applied to the elbow tendon helps relieve pain down the forearm. Hand wash in cool, soapy water and air dry. One size fits forearms with a circumference of 10" to 14" (25 to 36cm).